Development of bespoke eCommerce platform incorporating desktop and mobile. 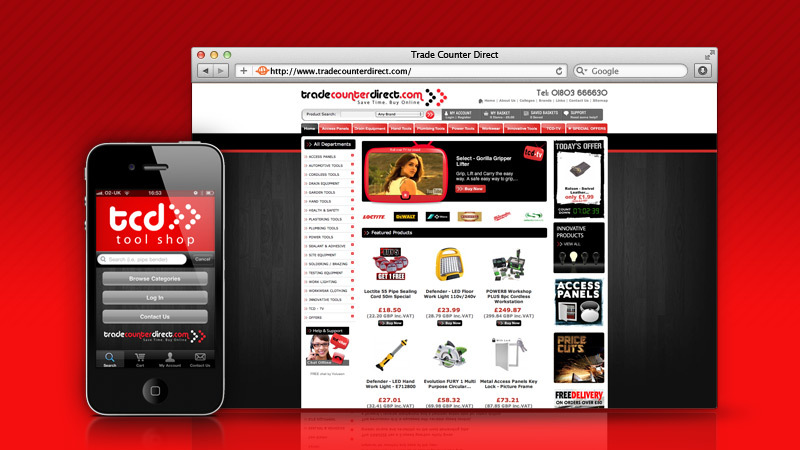 Trade Counter Direct is one of Createanet’s longstanding clients, with a website that won a Digital Entrepreneur Award for the company in 2010. The company supply tools and products to the building trade and the website propelled them to the forefront of the online tool market. As part of a regular review of their business, Createanet developers designed an app that is a natural extension of the website. The ability to shop online while on the move made perfect sense to busy builders and trades people who often need tools and materials delivered the next day. Trade Counter Direct now have an app available for download from Apple’s App store which enables their customers to log into their account, view past order history, update delivery addresses. They can shop quickly and easily using a simple keyword search and simple check out procedure. The app has received great reviews in trade magazines and on the Apple App Store. For Trade Counter Direct, it means increased sales and customer loyalty.